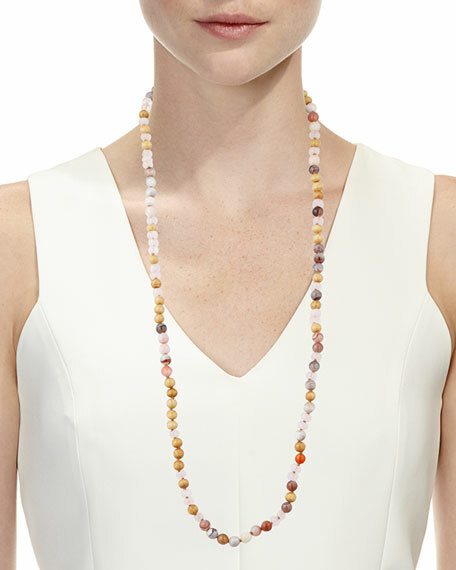 Chan LuuBeaded Tassel Necklace, 38"
Beaded necklace by Chan Luu. Pink colorway: Antique Bone Beads, Rose Quartz, Pink Botswana Agate, Rose Quartz. Turquoise colorway: Matte White Sodalite, Amazonite, Turquoise, blue Sodalite. Approx. 38"L; may be worn doubled. Devon Leigh long turquoise and lapis tassel necklace. Polished yellow gold brass hardware and settings. Round, multi-size blue turquoise stations. Devon Leigh long turquoise and lapis tassel necklace. Polished yellow gold brass hardware and settings. Round, multi-size blue turquoise stations. Five lapis and turquoise tassel drops. Slip-on style. Approx. 36"L. Made in USA. Please note: As this piece is handmade, exact stones and measurements may vary slightly. Devon Leigh mixed turquoise and leaf bib necklace. 18-karat gold-plated brass with 24-karat gold foil. Polished 14-karat gold filled chain and lobster clasp. Mixed, multi-size turquoise beaded single strand. Multi-strand golden leaf dangles form bib. Adjustable; lobster clasp. Approx. 30"L. Made in USA. Devon Leigh turquoise and chrysoprase tassel necklace. 24-karat gold electroplated curb-link chain and hardware. Mixed turquoise, chrysoprase and howlite beads. Devon Leigh turquoise and chrysoprase tassel necklace. 24-karat gold electroplated curb-link chain and hardware. Mixed turquoise, chrysoprase and howlite beads. Textured 18-karat yellow gold-plated accents. Multi-strand seed bead tassel pendant. Approx. 20"L; 2"L extender chain. 14-karat gold-filled lobster clasp. Made in USA.